TORONTO — The final 162 with John Gibbons at the helm are in the books. One year after winning just 76 games, the Blue Jays once again stumbled to a 73-89 record and now find themselves in the middle of a rebuild. Safe to say, when you come into the year expecting to compete for a postseason spot – realistic or not – and you end up 16 games below .500, the grades are going to be less than impressive when report card time comes. With the Jays now in off-season mode and a winter of roster tinkering ahead, let’s take a look at how every key player in a Blue Jays uniform graded out this season. There’s not a lot of positivity coming. You’ve been warned. It was a concern coming into the season, so it was no surprise when it was clear Father Time had caught up to Martin in his 13th season as a big leaguer. It took the 35-year-old until Aug. 14 to get his batting average over the Mendoza Line, and then Danny Jansen arrived and Martin played just a handful more games and didn’t see a start after Sept. 3. The highlight of Martin’s season is going to be debuting at shortstop midway through and then filling in for the outgoing Gibbons as manager on the final day of the season. He provided walk-off heroics on a couple of occasions early in the season and rode that success to the best season of his career. It says a lot about the state of your club when a guy who plays 68 games and hits three home runs finishes fifth amongst position players in WAR, but that’s exactly what Maile did, riding plus defensive contributions and a timely bat. He lost playing time to the youngsters late in the season, but the 27-year-old has proven he’s a capable MLB backup. The third catcher on this list, Jansen doubled down on his breakout season of a year ago to prove he deserves the title of catcher of the future. After slashing .275/.390/.473 in Triple-A, Jansen held his own in the majors, getting on base at a .347 clip and clubbing three home runs in 31 MLB games. He couldn’t duplicate the .833 OPS and 38 home runs he posted during his breakout season in 2017, but given the context of the lineup surrounding him and a couple of nagging injuries taking their toll, Smoak’s season was just fine. He hit 25 homers, and posted an OPS north of .800 for back-to-back seasons for the first time in his career, leading the Jays with a .350 on-base percentage and 121 wRC+. While Travis managed to avoid the DL, he simply wasn’t very good when he was on the field for 103 games. He didn’t drive the ball with the same type of authority, and his .232/.275/.381 slash line and below-average defence didn’t do him any favours when it comes to holding off a growing number of middle infielders bubbling up through the system. It was thought Travis would head into a healthy winter for the first time in a long time — he’s either been rehabbing knees or shoulders since 2015 — but the 27-year-old was shut down late in the season with left knee and hamstring soreness. The 2019 season is going to be a turning point for Travis. 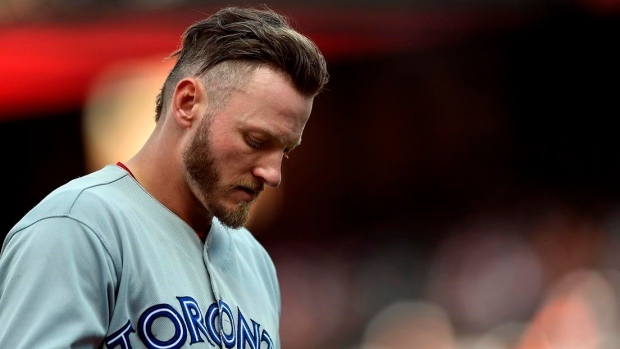 Seemingly primed for another MVP-type year after closing the 2017 campaign scorching hot, Donaldson came into the spring with a sore shoulder and provided an early lowlight when he could barely get the ball across the diamond on opening day. It was all downhill from there, as a DL stint for the shoulder turned into a left calf issue in late May and he never played another game for the Blue Jays. Now, all the Jays have left to show for one of the best players in franchise history is minor-league arm Julian Merryweather, who can’t even be officially added from the Cleveland Indians until sometime this off-season. In 36 games with the Jays, Donaldson hit five homers. In 16 games with the Indians to finish out the season, he clubbed three. Had he not rolled his ankle at first base in May down in Tampa, forcing him to miss three weeks, Diaz’s season might’ve looked really interesting in the end. As expected, he wasn’t as good as his rookie season with the St. Louis Cardinals in 2016, but he also wasn’t as bad as last year when he got demoted and eventually traded to Toronto, splitting the difference between a 132 wRC+ and a 77 wRC+ with a 102 mark and a career-high 18 home runs. Better than expected defensively and with enough versatility to capably transition to third base late in the season, the 28-year-old Diaz would be a nice piece on a contender. Overall, in terms of fWAR, Diaz was the third-most valuable position player on the roster this season at 1.6 WAR. In the conversation for best story of the year, Gurriel arrived in the majors after just 115 minor-league games and struggled out of the gates. But following a demotion in May, Gurriel returned to slash .309/.339/.497 with nine home runs in 44 starts the rest of the way, sandwiching in a franchise record with 11 multi-hit games in a row. His defence is a work in progress and a growing number of minor injuries is a concern, but Gurriel’s bat is exciting. He captivated fans early with his home run clap down the third base line and his energy in the dugout. 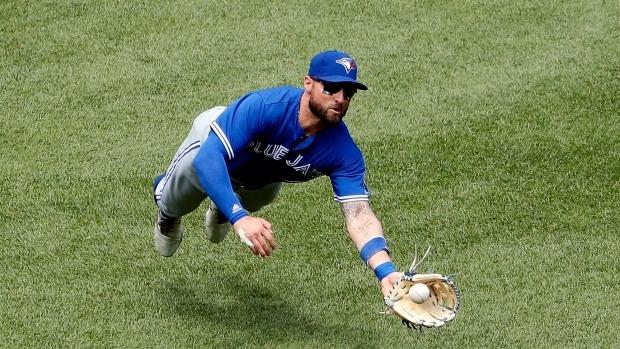 But that didn’t last long, as the 31-year-old utility infielder loafed his way to a ghastly minus-1.3 WAR and grounded into 21 double plays, the second most in the American League. The only reason Solarte didn’t lead the league is because he started just eight games after straining his oblique Aug. 11. It’s looking doubtful that his $5.5 million option for 2019 will be picked up. The toast of the town in April when he arrived after a brief stint in Triple-A to slug .677 in 15 games, Hernandez couldn’t sustain that type of production and suffered through an ugly summer. In addition to defensive concerns leading to an ugly minus-16 Defensive Runs Saved in the outfield, Hernandez slashed just .209/.292/.395 after the all-star break and struck out a whopping 77 times in 195 trips to the plate. Despite a slightly above average 107 wRC+ and 22 homers, Hernandez is assured of nothing next spring. To paraphrase the late, great Dennis Green, he is who we thought he is. As the free-swinging Pillar approaches his 30th birthday in January, his defence his slipping and he continues to show an inability to make the necessary adjustments at the plate. He’s been worth at least 2.0 WAR for four years running, making him useful, but there just isn’t much upside there anymore. Pilar did what Pillar does in 2018. He started hot, slashing .308/.344/.509 with four homers and eight stolen bases through 44 games, but his May swoon started right on cue and he couldn’t break out of the funk. Over his next 98 games, Pillar hit just .224 with a .636 OPS and took just nine walks. It was a tale of two seasons for Grichuk, who came over in a January trade with St. Louis eyeing a long-awaited breakout season. Grichuk was so bad to start his Blue Jays tenure that some were calling for his release when he went on the DL with a knee injury and a .106/.208/.227 slash line at the end of April. After a couple of adjustments, including a more upright batting stance, Grichuk returned as a new player, hitting .275 with an .885 OPS and 23 home runs over his next 380 plate appearances. Signed for $5 million last off-season, Granderson provided exactly what was expected – leadership, a veteran presence, and some pop against right-handed pitching – before being traded to the Milwaukee Brewers for the stretch run. One of the good guys in the game, a .772 OPS is just fine at the age of 37. Similar to Grichuk, Morales was able to pull his season out of the sewer after an awful start saw him slashing .188/.260/.312 with just four home runs on June 5. Morales found his groove, though, slashing .280/.366/.502 the rest of the way to finish fourth on the team in bombs with 21 behind Grichuk (25), Smoak (25) and Hernandez (22). In the end, Morales’ second season in a Blue Jays uniform ended up being more productive than the first, but he’s still owed $12 million in the final year of the deal in 2019. Is it just me or does 2016 feel like a lifetime ago? There was a day when Sanchez’s sinker was sawing off bats and pitching the Blue Jays to the playoffs on the final weekend of the season in Boston. That’s now two full years ago and Sanchez has made 28 starts since. Last year, it was blister issues on his right hand. This year, it was a freak suitcase accident in June that got in the way, eventually ending his season with surgery in September. In 20 starts this year, Sanchez posted a 4.89 ERA and never really had any sort of command or feel for his pitches thanks to the finger issues and all the time off. There’s still hope for the 26-year-old, but there’s suddenly no guarantee he’ll ever get back to looking like a top-of-the-rotation starter again. Shoulder inflammation set him back in spring training and Stroman never recovered. In an ill-advised manner, the 27-year-old rushed to make it back for the opening series of the season, but he was terrible, giving up at least four earned runs in six of seven starts before going on the DL in early May with a 7.71 ERA and a bruised ego. 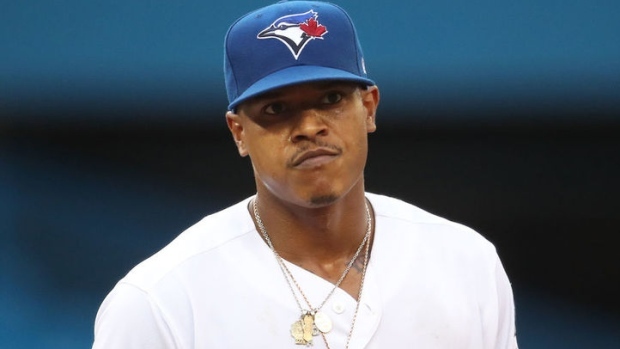 Stroman looked more like himself when he returned, but it was still up and down until blister issues cropped up in August and he was eventually shut down for the season. The one good sign is his peripherals say he wasn’t as bad as the results and there’s hope for a turnaround in 2019. Happ did exactly what was needed, pitching well enough to become one of the better trade chips at the trade deadline. 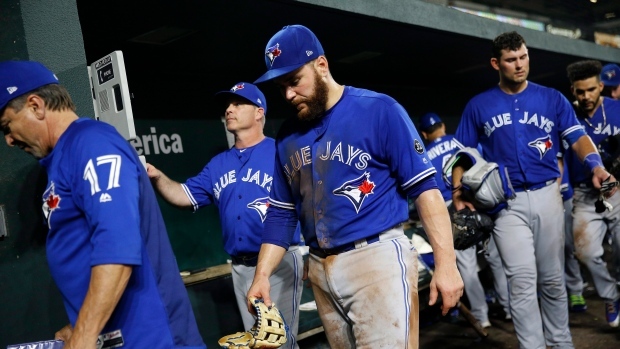 It’s debatable if GM Ross Atkins cashed the 35-year-old free-agent-to-be in for the right package –Brandon Drury and Billy McKinney excite some more than others – but Happ went 10-6 for a bad baseball team and was worth 2.1 WAR. Amazingly, despite pitching two-thirds of the season in another uniform, Happ still finished third on the Jays staff with 114 innings. You know things have gone sideways when you’re handing out the third failing grade to an area of the team that was a supposed strength heading into the year. Thanks to a bad back and dropping velocity, the 35-year-old Estrada was one of the worst starters in the American League, pitching to a 5.64 ERA in 28 starts. Just when you thought it couldn’t get any worse you realize the Jays paid Garcia $10 million to get torched every fifth day. There’s not much to say about a 5.93 ERA in 81 innings other than it’s really, really bad and you have to hope the Jays front office can invest more wisely in the rotation down the road because they’re going to have to be able to find a bargain or two in order to supplement the core of bats they’re developing in the system. Acquired from the Kansas City Royals in exchange for a player to be named later in March, Gaviglio ended up throwing the second-most rotation innings (119.1) on the team. That’s not exactly a good thing considering he was supposed to be emergency depth. Even though he went 3-10 with a 5.31 ERA, the soft-spoken 28-year-old righty, for the most part, kept the team in ballgames. Aside from producing a more than solid 3.87 ERA in 17 starts, Borucki provided hope. Hope that the Jays could, with a little luck, piece together an interesting rotation as early as 2019 if Stroman and Sanchez can return to form and health. The 24-year-old Chicago native isn’t overpowering, but his fastball-changeup combo is sneaky good when he’s on and he works quickly. The rotation experiment ended early in the season when it became clear it wasn’t going to work and Biagini spent the next four months trying to salvage his season in the bullpen. Opposing batters hit .323 off Biagini this season. That’s not good. Signed to a minor-league deal in the spring, Clippard posted a 3.67 ERA and was used a team-high 73 times, striking out 85 in 68.2 innings of work. In terms of return on investment, this was a win. Tepera struggled as part of a closer committee when Roberto Osuna’s legal troubles popped up, likely showing the organization that his true ceiling is that of setup man. Worked hard over the past two seasons with 141 appearances, Tepera pitched to a 3.62 ERA in 64.2 innings and racked up seven saves, which will help him in arbitration this winter. Arrested May 8, the rise and fall of Osuna was swift. When he was on the mound, like he has been his entire career, the 23-year-old was lights out, but the off-the-field baggage was too much for the Blue Jays and they shipped him to the Houston Astros at the July trade deadline in exchange for a package better than most expected considering the legal troubles, which have now been resolved. Giles was the headliner of the package coming back for Osuna, and he quickly showed the ability to be overpowering. While he had a 4.12 ERA in 21 games with the Jays, that was mostly due to a couple of blowups in non-save situations.